Service engineers at North Yorkshire and York PCT are using Rigel Medical’s trolley case-based biomed field service kit Med-eKit to undertake electrical safety testing of medical devices located at dozens of sites. The PCT has thousands of assets and uses dozens of medical devices like patient monitors, defibrillators and infusion devices to provide high levels of patient care and service. These are located at over 280 sites, including 10 hospitals, from High Bentham in the west to Scarborough in the east and from Stokesley in the north to Selby in the south - a geographical area spanning approx 3,200 sq miles. 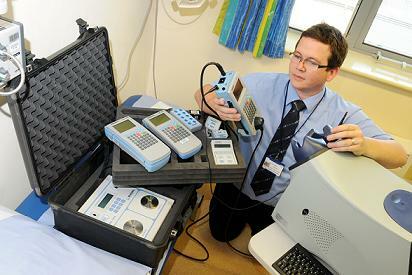 The four Med-eKits were purchased to enable the Medical Engineering Department based at Malton, Norton and District Hospital to undertake the medical device testing service more cost effectively and efficiently than previously – it used to be done by five acute trusts and various OEM suppliers. The portability of the Med-eKit, which features several different types of medical test equipment within a self contained, easy-to-transport package, has been welcomed by the engineers, who travel to several different sites to test medical equipment. The kit ensures they have the appropriate analyser to hand for testing purposes, enabling them to get in and out of jobs faster and record information more accurately and efficiently. It features hand-held analysers for electrical safety (Rigel 288), NIBP (Rigel BP-SIM) and SP02 (Rigel SP-SIM) simulator, a battery operated patient simulator, defibrillator analyser, ventilator tester, printer and barcode scanner and asset management software housed within a compact and lightweight wheeled Pelican trolley case. General Manager of Medical Devices, ICES and Wheelchair Services for North Yorkshire and York Community and Mental Health Services is Brian Jolly. He said: “The portability of the Med-eKits is very good, making it easy for engineers to get the right equipment from the vehicles to the test site. Med-eKit can be used for the rapid testing of electrical safety and operation of medical devices and equipment used in hospitals, operating theatres and other facilities. Foam inserts safely hold the instrumentation in place and provide protection during transportation, while the kit can be further customised to meet individual specifications with the inclusion of a laptop, multi-metre, temperature metre and power analyser. Med-eKit is suitable for field service engineers requiring a flexible, easy-to-use and accurate solution for testing medical devices for both functionality and electrical safety to manufacturer’s specification or to a number of internationally accepted standards and guidelines such as: IEC 62353, IEC/EN60601-1, VDE 0751-1, AS/NZS 3551, AAMI, NFPA-99, MDA DB 9801-2006 etc. Traceability is improved with the Rigel 288 as information can be downloaded into Med-eBase – an easy-to-use asset management software. This enables the user to store and manage test results, email html test certificates to clients and schedule new work orders, which can then be fully uploaded into the Rigel 288’s large onboard memory. The lightweight and battery-powered Rigel BP-Sim utilises patented technology to simulate a wide range of blood pressures to verify the accuracy and safe operation of all leading NIBP monitors currently used in healthcare and medical facilities. The SP-Sim SP02 simulator is the first hand held simulator of its type featuring pulse volume adjustments, heart rate and manufacturer specific R-curves, combined with large capacity internal memory for the data capture, storage and downloading via Bluetooth of test results for record keeping. Med-eKit forms part of a comprehensive range of high performance specialist biomedical test equipment supplied by Rigel Medical, part of the Seaward Group. Rigel Medical is based at Bracken Hill, South West Industrial Estate, Peterlee, County Durham, SR8 2SW.